Longtime Guild member Dave Wilkie passed away last Tuesday, December 10th. As we remember him fondly, please keep Jo-Anne and his entire family in your thoughts and prayers. David John Wilkie, 80, of St. Clair, slipped from the physical world on Dec. 10 after a series of health problems over the last two years. He was born in Detroit and graduated from Southeastern High School. 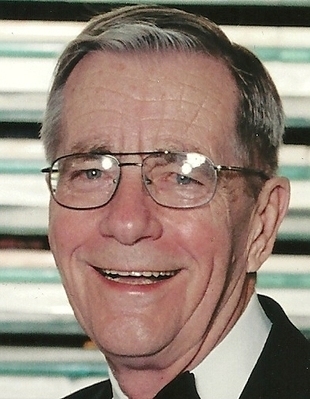 An engineer, he and his brother Bill formed Wilkie Brothers, a conveyor manufacturer for mass assembly, in Detroit before relocating the firm to Marysville in 1985. A veteran of the U.S. Army, Dave worked for Chrysler for more than a decade in Indianapolis between two stints at Wilkie Brothers. But the arts – music, the stage and the visual arts – truly animated his life. A baritone who also sang tenor, he loved singing and would break into song at work, in taverns and while mowing the lawn. He sang with the Dearborn Community Chorale, St. Clair Community Singers, the St. Mary’s Choir and the male a cappella group Susquatch, which he cofounded. He sang as Davey O’Day for 17 St. Patrick’s Days at Murphy Inn. Dave performed in numerous St. Clair Theatre Guild productions and booked music for two decades for the St. Clair Art Fair. “He was always singing and laughing and wanted people to be up,” said Jo-Anne, his wife of 37 years. Dave was preceded in death by his wife Marcelyn and their daughter Kristyn. He is survived by daughters Kathryn Dunn (John) and Lynda Campbell (Colin Powers); sons Scott (Mary), U.S. Army Col. David (Christine) and Robert; step-daughters Anne LaBrecque (Leon), Kathryn Klink (John) and Mary Poleto (Chris); 14 grandchildren and six great grandchildren. They will forever be filled by his irrepressible spirit. Visitation in the L.C.Friederichs & Son Funeral Home, Monday from 3-8 PM with 7 PM rosary. In state Tuesday at St. Mary’s Catholic Church, St. Clair from 10 AM till mass at 11 AM. Contributions in memory of Dave may be made to the St. Clair Art Association and/or St. Clair Theatre Guild. This entry was posted in News and tagged Dave Wilkie, obituary on December 15, 2013 by Tom Kephart.